Tate Jozokos has had an incredible high school athletic career, both at Kingswood High as a freshman and then for the following three years at Governor's Academy. He is one of the best 3-sport athletes to come out of NH in a very long time. He starred at quarterback in football, mid-fielder in LAX and guard in basketball. "Trying to pick a couple memories from the past 4 years is definitely difficult" Jozokos told the NH Notebook. "I have been fortunate to play on some great teams with some great players. My fondest memory at Kingswood was playing in the state lacrosse championship my freshman year. Playing for my dad was fun and helping the team reach the championship after a 10-year drought was exciting. For the past 3 years, I have played football, basketball and lacrosse at The Governor’s Academy. I have many fond memories, which include 2 undefeated and New England Championships in football. This past spring in lacrosse, I was named 1st Team All-American and ISL Player of the Year. However, my proudest accomplishments are committing to the University of North Carolina and being selected as an Under Armour All-American." 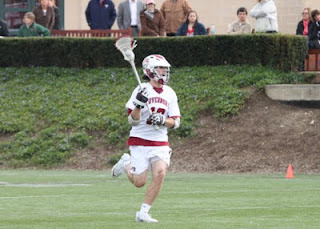 Jozokos tallied 44 goals, 14 assists and 96 groundballs this season for the Governor's LAX team, which went 14-2. He committed to UNC when he was only a sophomore. "Currently, I am not attending any summer classes at UNC" Jozokos explained. "UNC has provided a workout program so that I am prepared for fall ball in September. The thing that I am most looking forward to is being part of another family and working towards a national championship." Jozokos is a college level athlete in 3 different sports, and in one of those sports he's one of the top players in the country. He has achieved both individual and team success, and done it all while maintaining a 3.3 GPA. He is well deserving of the first annual NH Notebook Male Athlete of the Year award. "I am thankful for the things I have accomplished, and the opportunity that I get to take my skills to the next level" Jozokos concluded. "I would say for the players of the future that if you want the same thing I have you have to earn it. I look back at the sacrifices that I have made and my parents since I was 12 years old and it is the reason why I am in the position I am today. Also, don’t focus just on lacrosse, be well rounded and play as many sports as you can."